Since armed unrest erupted more than 4 years ago in Syria, WHO has taken a lead role to support the displaced. Crippling funding shortfalls are hindering the ability of emergency teams to meet the escalating health needs of the millions of Syrians displaced by civil war and donors need to step up support to countries in the region doing the “heavy lifting,” warned the World Health Organization (WHO). “The international community must continue to support the countries doing the heavy lifting,” Dr. Al Ward said. The agency said the health component of the 2015 Syria response plan is only 30 per cent funded, while the health component in the regional refugee and resilience plan is only 17 per cent funded. Though intense fighting and shifting zones of conflict have hindered the ability of health workers to reach some areas, WHO says its staff have enabled the medical treatment of more than 13.8 million people this year across Syria. WHO also said cross-border activities from hubs in Turkey and Jordan have increased the organization’s assistance to populations in need in Syria. WHO staff have been working to ensure that life-saving medicines and medical supplies reach Syrians and the region’s host populations and governments; technical assistance is given to the region’s ministries of health, with health care workers being trained; mass vaccination campaigns are supported; and the ability to monitor outbreaks of communicable diseases is boosted. “Inside Syria, the conflict, now a civil war” – has left 12.2 million people in need of humanitarian assistance, with more than 7.6 million of them internally displaced, according to UNHCR. And more than 4 million Syrians are registered as refugees and are living outside their countries. The 1.1 million Syrians now living in Lebanon represent a third of that country’s population. In Jordan, some 600,000 Syrians have found refuge. WHO has also been supporting the ministries of health of Jordan and Lebanon to ensure adequate and equitable health care service provision for both Syrian refugees and their host communities. “With the conflict in Syria showing no sign of abating, it is unclear how long the emergency health response will be needed in the Middle East,” WHO said, but warned that funds, are not keeping pace with the growing needs, and the health sector is struggling to keep systems from collapsing. 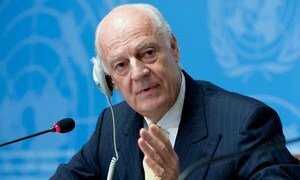 Returning from consultations with Syrian interlocutors in Damascus and Istanbul, the United Nations Special Envoy for Syria announced today that he met with facilitators appointed by the Secretary-General to head working groups designed to find a political solution to the five-year conflict.